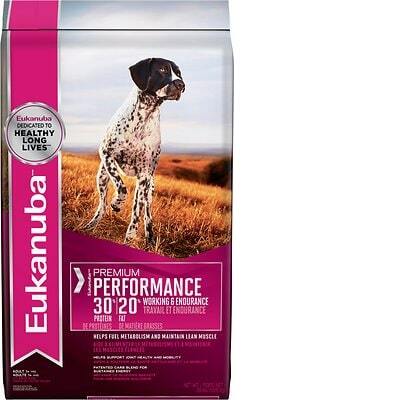 Eukanuba Premium Performance 30/20 Adult is a low-priced dry dog food with overall lower quality. This product has 5 controversial ingredients, including an artificial flavor. The food has a relatively well-balanced amounts of protein, fat and carbs but mixed meat and fat quality. Eukanuba has an above-average number of recalls. However, the company was very open when answering our transparency questions. Chicken, Chicken By-Product Meal (Natural Source of Chondroitin Sulfate and Glucosamine), Corn Meal, Brewers Rice, Ground Whole Grain Sorghum, Chicken Fat (Preserved with Mixed Tocopherols, a Source of Vitamin E), Dried Beet Pulp, Chicken Flavor, Fish Meal, Dried Egg Product, Fish Oil (Preserved with Mixed Tocopherols, a Source of Vitamin E), Brewers Dried Yeast, Potassium Chloride, Fructooligosaccharides, Salt, Sodium Hexametaphosphate, Choline Chloride, Minerals (Ferrous Sulfate, Zinc Oxide, Manganese Sulfate, Copper sulfate, Manganous Oxide, Potassium Iodide, Cobalt Carbonate), Calcium Carbonate, Vitamins (Ascorbic Acid, Vitamin A Acetate, Calcium Pantothenate, Biotin, Thiamine Mononitrate (Source of Vitamin B1), Vitamin B12 Supplement, Niacin, Riboflavin Supplement (Source of Vitamin B2), Inositol, Pyridoxine Hydrochloride (Source of Vitamin B6), Vitamin D3 Supplement, Folic Acid), Dl-Methionine, Vitamin E Supplement, L-Carnitine, Beta-Carotene, Rosemary Extract. The average dog food we reviewed has 39 total ingredients, with 1 controversial ingredient. This product has 5 total controversial ingredients and 2 of them are found in the first five ingredients. This is concerning because the first five ingredients make up most of the product. Meat by-products are animal parts other than meat that are left over at the slaughterhouse. This can include the lung, spleen, brain, liver, blood, bone, beaks, kidneys, fatty tissue, and intestines. Because there is a wide variety of animal parts companies can use, and because details don't need to be disclosed, it's tough to compare the quality of different by-products. Generally speaking, by-products can provide important nutrients for dogs but can be of lower quality than meats and meat meals. For these reasons, we do not consider this a high-quality ingredient. Chondroitin sulfate is a chemical that's naturally found in the cartilage around the joints of animals. Glucosamine is a combination of glutamine (an amino acid) and glucose (a sugar) that's present in chicken. Corn meal is a lower cost ingredient that does provide energy, but dogs can be sensitive to it. As a kernel it is not digestible, so it must be processed, but that processing leads to a higher glycemic index. Corn meal is not generally considered a controversial ingredient, but is controversial if it is used in the top five ingredients (which make up about 80% of the food's weight) where a named meat or lean protein would be more nutritious. Brewer’s Rice is considered controversial if it is in the first 5 ingredients. It is basically white rice that has been broken into smaller pieces. It's a waste product of the milling process and considered a low quality ingredient because it's missing many of the nutrients contained in whole ground rice and brown rice. The meat quality of this product is mixed. Chicken and Dried Egg Product is clear on the source and what is being used. Chicken By-Product Meal could be a number of organs and parts so it’s unclear and not considered high quality. The ingredient Fish Meal does not tell us the species of fish, and further down you will see Fish Oil - both lead to the same concern. On a better note, Eukanuba does list Chicken Fat as a named fat source. This product does not contain controversial preservatives. It’s good to know that ‍not all artificial preservatives are bad. That’s because they serve an important purpose, which is to prevent food from spoiling. However, we consider 11 artificial preservatives controversial because of their potential link to cancer and other serious health conditions. This product does use an artificial flavor. Its listed on the label as “Chicken Flavor”. Eukanuba has a above-average number of recalls. Eukanuba dry dog foods in the following sizes, varieties and date codes: Eukanuba Naturally Wild, all dry sizes and varieties, “Best by” dates from July 1, 2010 to Dec. 1, 2011, Eukanuba Pure, all dry sizes and varieties, “Best by” dates from July 1, 2010 to Dec. 1, 2011, Eukanuba Custom Care Sensitive Skin, all dry sizes, “Best by” dates from July 1, 2010 to Dec. 1, 2011. 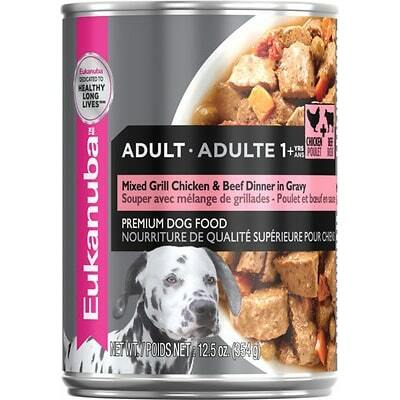 Various Eukanuba wet pouch and canned pet food products under specific lot numbers. 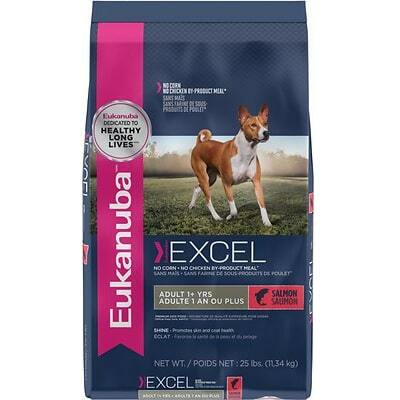 Eukanuba is part of the Mars family of brands and was pretty responsive. It only required one email, and they responded in 4 days. Not lightning fast, but compared to the average it was good response time. This response felt more like a marketing response, and dodges the actual question. They were unable to provide any names of the professionals involved in the formulation of the product. This question was not explicitly answered for the Eukanuba line.